Here is a good selection - I'm biased, of course - of some really interesting articles on different topics. An instant cure: The latest edition of the psychiatrists’ manual has decided that my personality disorder is not so bad after all. Voices from Solitary: A Sentence Worse Than Death: I have served a sentence worse than death. 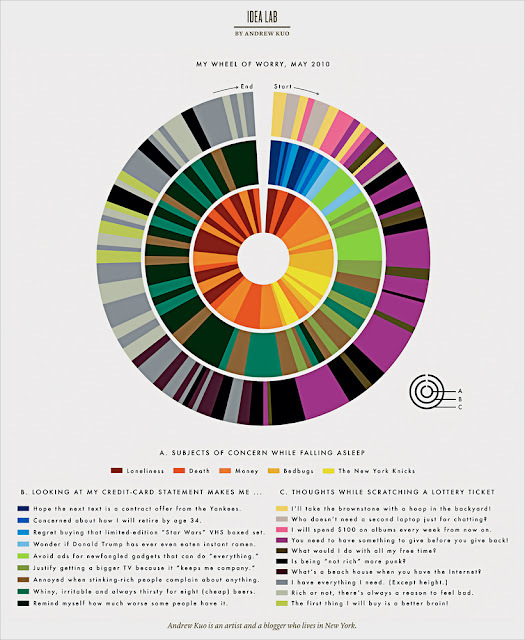 This wheel of worry, violently copied from the last Brain pickings newsletter, explains how one individual organized his circadian states of anxiety. I find the wheel type of presenting the focus of anxiety during the day as a powerful instrument to reflect upon how we live our emotional states. We should make ourselves stop trying to explain our own difficulties. Our first impulse is to try to account for them, figure out why what has happened. Sometimes such an effort is beneficial: more often it is distinctly harmful. It leads to introspection, self-pity, and vain regret; and almost invariably it creates within us a dangerous mood of confusion and despair. Many of life’s hard situations cannot be explained. They can only be endured, mastered, and gradually forgotten. Once we learn this truth, once we resolve to use all our energies managing life rather than trying to explain life, we take the first and most obvious step toward significant accomplishment. although it makes sense that we probably can't explain everything, we are lead to think that we should. Is that positive? Does it have to be explained as being positive or negative? Probably just a sign that we need to make sense of ourselves. do we have to start to reason before we understand why a specific emotional state dominates us? What is anxiety and what are the emotions that characterize the way we position ourselves toward the Others, the World? Is this quote based on the assertion that thoughts are our experiences? There's no cognitive mark when experiencing events that have a significant impact; there's a bodily experience that modifies our emotional state, which we will use to create meaning of a specific event but also about ourselves, the fabric of our being. Hoje vi um senhor com cartaz, a pedir. A pedir numa das ruas principais de Kingston, no Canadá. A pedir. Não é o primeiro, não será o último. Se fechasse bem os olhos, diria que estava algures num país pobre ou mais pobre do que o Canadá. Afinal de contas, todos os indicadores apresentam melhorias significativas relativamente ao ano passado, crescimento económico, qualidade de vida, enfim, basta olhar para eles. Contudo, cada vez mais me apercebo da elevada disfuncionalidade que grassa nesta sociedade. Uma camada rasteirinha, que vive de subsídios e completamente encostada ao chão, totalmente ausente da sociedade. Uma classe média baixa que vive de part-time toda uma vida ou ainda um grupo de pessoas que fazem dos trabalhos relief, que mais não são do que trabalho temporário com uma pitada de fantasia, o auxílio para as despesas. Dessa forma, aniquilados numa qualidade de vida reservada a grupos da sociedade que fazem o seu trabalho das 8 às 5, sobrevivem. Fazem aleluia a um país fantástico. Por necessidade, por quererem acreditar, por não poderem mudar. Um sinal, importante. Adding two more videos from Robert Elliott. Note the good definition of Self in the second talk. We all know that sleep is very important for our mental and physical health, as seen here and here. Now there is research that looks into the processes of consolidation of memory during sleep. the mechanism that enables the brain to consolidate memory and found that a commonly prescribed sleep aid enhances the process. A democracia é uma coisa chata, principalmente quando os tempos são difíceis. Creio que na Irlanda estão também a preparar uma revolução...ou talvez tenha ouvido mal e estão só a tentar que o país consiga voltar a proporcionar melhores condições de vida aos seus habitantes. Visto que o problema de Portugal é a incapacidade de a economia crescer e criar empregos e riqueza, espero que o capitão (Chávez era comandante, daí os melhores resultados) se refira a uma revolução que incida sobre esse problema. E que ao mesmo tempo, sem apoio do povo nem da Europa, que pague do seu bolso a diferença entre os rendimentos atuais e o valor para o qual descerão se a sua revolução for avante. Estou em crer que ele está apenas sensibilizado com a morte de Chávez. Compreensível. Compreendo as causas implícitas do comentário do Vasco Lourenço mas as pessoas têm que assumir alguma responsabilidade pelas afirmações que fazem. Qualquer dia o contexto é a substância e isso não faria muito sentido. A notícia do Jornal Público. Reality as watched by the filters of television is created for the maximum emotional shock value. Entrevista com o coordenador do projeto, Prof. Doutor Joao Salgado. Children's sleep or, to put it better, everyone should have enough sleep time so that our daily experiences are properly assimilated and organized in our brains. Don't let yourself fool by the romantics. “Six hours’ sleep for a man, seven for a woman, and eight for a fool,” Napoleon famously prescribed. This myth that early risers are good people and that late risers are lazy has its reasons and merits in rural societies but becomes questionable in a modern 24/7 society. The old moral is so prevalent, however, that it still dominates our beliefs, even in modern times. The postman doesn’t think for a second that the young man might have worked until the early morning hours because he is a night-shift worker or for other reasons. He labels healthy young people who sleep into the day as lazy — as long sleepers. This attitude is reflected in the frequent use of the word-pair early birds andlong sleepers [in the media]. Yet this pair is nothing but apples and oranges, because the opposite of early is late and the opposite of long is short.